I have a small standard olive tree in a large pot on the small area of decking outside my central London apartment. It thrives in its exposed, dry spot, though the unpredictable weather means it doesn’t always live up to the promise of its copious spring blossom. 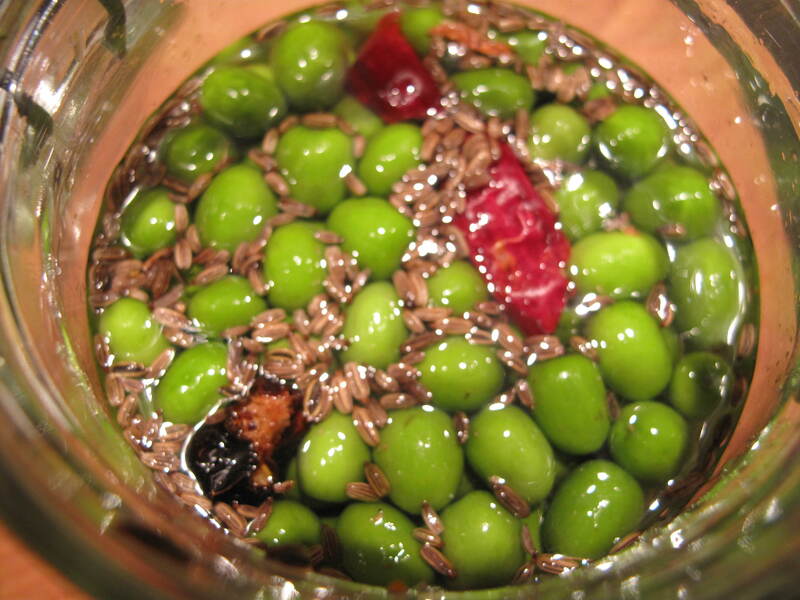 It usually manages to produce between half a dozen and thirty small black olives. Very small black olives. This is a crop worth pointing out to my father, whose Surrey-based olive is generally even less successful than mine, but not material for any great culinary experimentation. 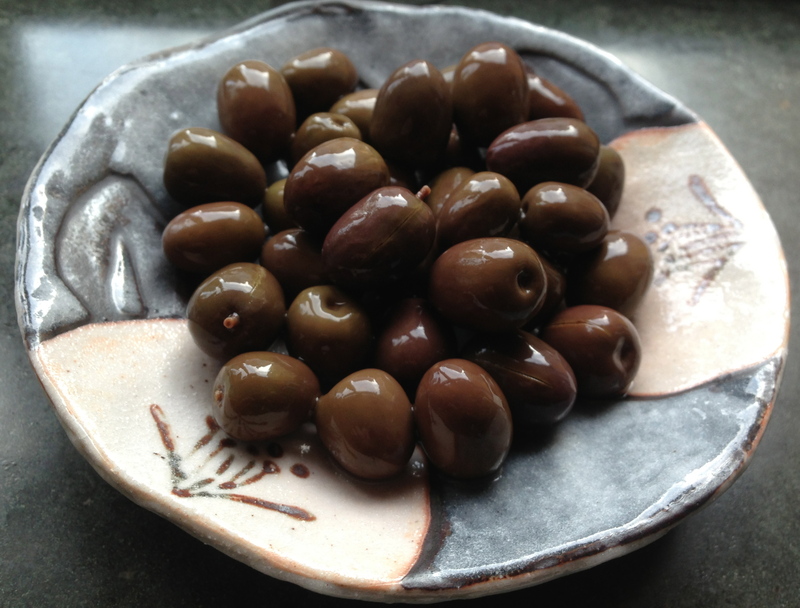 However, last year the tree had to spend the summer in a different spot while the building was refurbished, and the added hardship had an amazing effect: the olives didn’t ripen, but they were an edible size, and they were numerous. In fact, I had a crop of 2kg of beautiful bright green olives. Time to do something with them! I consulted the documents generously published on the web by the Department of Food Science and Technology at the University of California Davis and decided on brine-curing. Before placing them in the seasoned brine they had to be slashed and soaked in a daily change of fresh water for two weeks. They were still so bitter after two weeks I decided to extend the fresh water treatment for another week. Then, with some fennel seed, chilli and vinegar added to enliven the salty brine, they went into a medium-temperature, dark cupboard for a month or two of maturation. The colour changes dramatically from the bright green on the left to the deep olive green on the right. Of course, the real question is, what do they taste like? 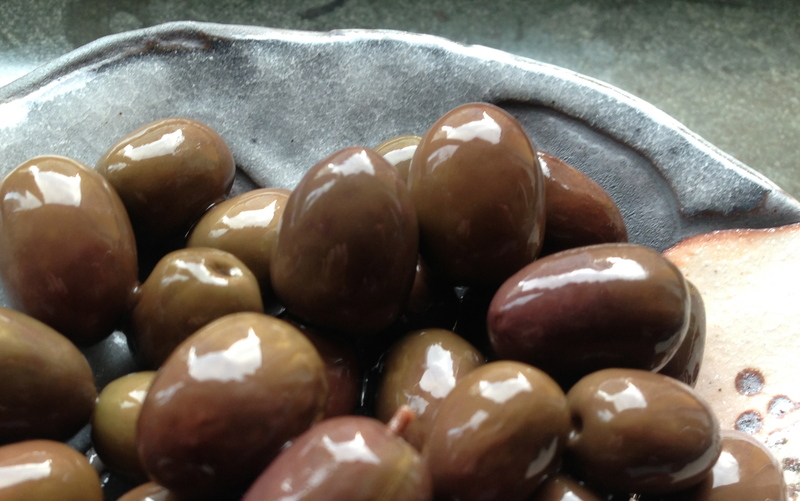 If I am honest, they are not the best olives I’ve tasted – there is a lingering bitterness in some of them, and they are quite crisp. But they have turned a beautiful deep olive green, they have a clean simple taste – and it’s really hard to beat the thrill of being able to chew on my very own urban olive harvest over an aperitif.